"Every aspiring writer knows that agents and editors are always looking for excellent writing, writing that will keep readers spellbound. You may think that only a talented few can produce such writing—but that’s not true. In the scientific field of expertise studies, researchers have shown that talent has little to do with building expertise; what counts is dedication to deliberate practice. This book—the first of its kind—is your guide to building your skills the same way professional athletes and musicians build theirs: through practice and imitating models of excellence. In this classroom-tested program, you’ll be shown what to practice, and how to practice, as you take one step after another along the path to writing mastery." Spellbinding Sentences is the first book to instruct writers how to improve their craft through training their brains to work differently. By utilizing practice exercises, you'll be able to train your brain to come up with words and arrange them more effectively. 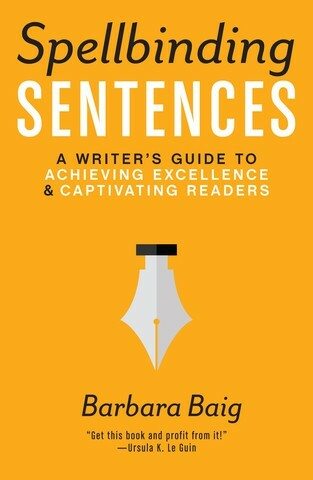 More than just a resource book,Spellbinding Sentences will change the way you write to allow you to elevate your craft. As you train your mind, you'll begin to enhance your vocabulary and start writing sentences that give your story the impact you want. Regardless of what genre you write, you'll learn how to master your craft and create sentences that draw the reader in, keeping them engaged until the very end. With a purchase of Spellbinding Sentences you will receive a free bonus chapter from the author. This chapter features brand new material, not covered in the book. Titled "Where Do Our Words Come From? ", this chapter talks about the origins of our language, how we inherited our words, how we "borrowed" words, and how we invented words. Writer and self-described "maverick educator" Barbara Baig has been helping adults and college students learn how to write since 1984. Barbara's real-world writing experience, combined with her passion for teaching, has enabled her to develop an approach that is innovative, practical, and empowering, helpful to amateur and professional writers alike.